Zach, Gillian and Allison with their catch! 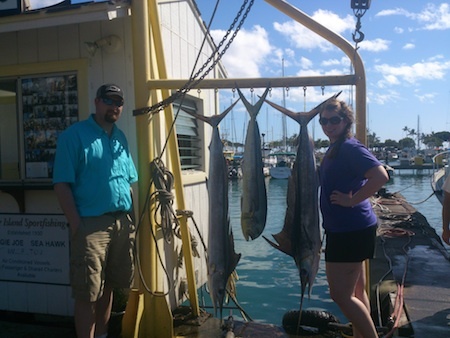 Mahalo to Zach, Gillian and Allison for choosing Maggie Joe Sport Fishing! 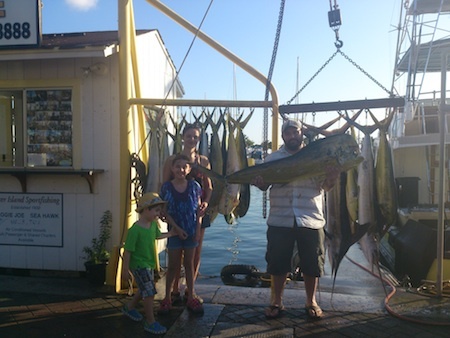 The family joined Captain Mike aboard the Maggie Joe and were able to bring home a pair of Mahi Mahi after a day of deep sea fishing off Honolulu, Oahu. Aloha! 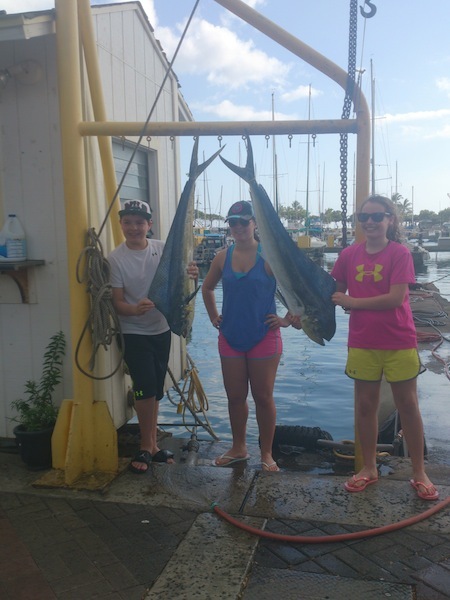 Big Mahalo to Gordon, Sara, Emma and Ethan for choosing Maggie Joe Sport Fishing! 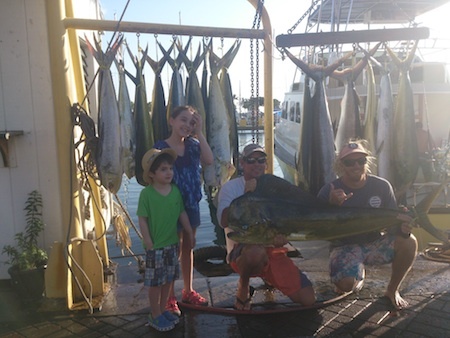 The family joined Captain Mark and Mate Ty aboard the Maggie Joe on a sport fishing charter. They hauled in a total of 3 Striped Marlin and 18 Mahi Mahi while deep sea fishing off Honolulu, Oahu. Aloha! 5 Mahi Mahi and a pair of Aku caught on the Ruckus! Eric and Kelly with 2 Striped Marlin and a Mahi Mahi! 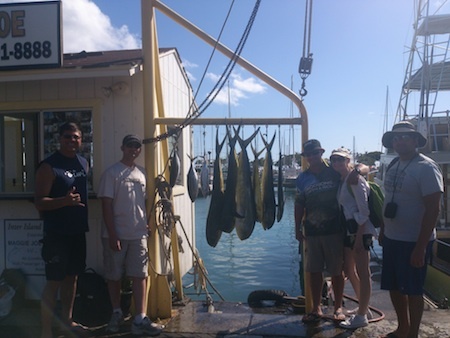 Mahalo to Eric and Kelly for choosing Maggie Joe Sport Fishing! They joined Captain Mark aboard the Maggie Joe on a sport fishing charter. While deep sea fishing off Honolulu, Oahu they hauled in a pair of Stripey’s and a Mahi Mahi. Aloha! Barry, Landon and Jonathon with their haul! Big Mahalo to the guys for choosing Maggie Joe Sport Fishing! They hauled in 5 Striped Marlin and 1 Mahi Mahi while deep sea fishing off Honolulu, Hawaii aboard the Maggie Joe! Aloha! 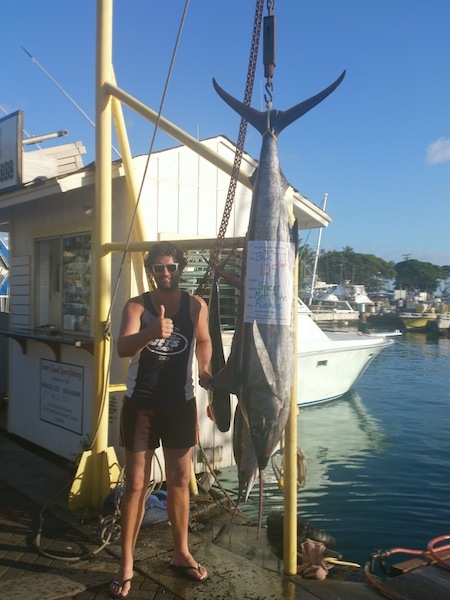 Spicer with 125 lb Blue Marlin! 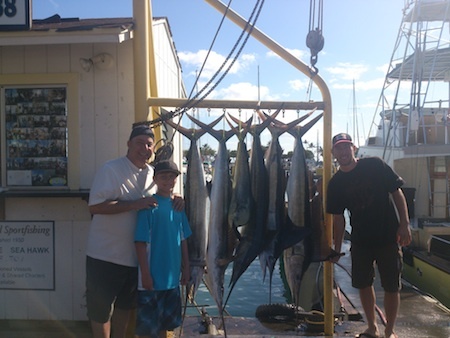 Mahalo to Spicer for choosing Maggie Joe Sport Fishing! He hauled in this nice 125 lb Blue Marlin while deep sea fishing aboard the Ruckus on a deep sea fishing charter. Aloha! 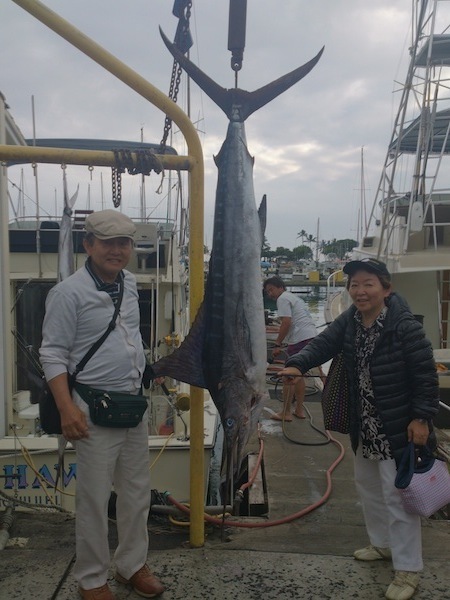 Mahalo to Tadashi for choosing Maggie Joe Sport Fishing! He joined Captain Darryl aboard the Sea Hawk on a deep sea fishing charter off Honolulu, Hawaii and was able to haul in this nice 70 lb Striped Marlin! Aloha! 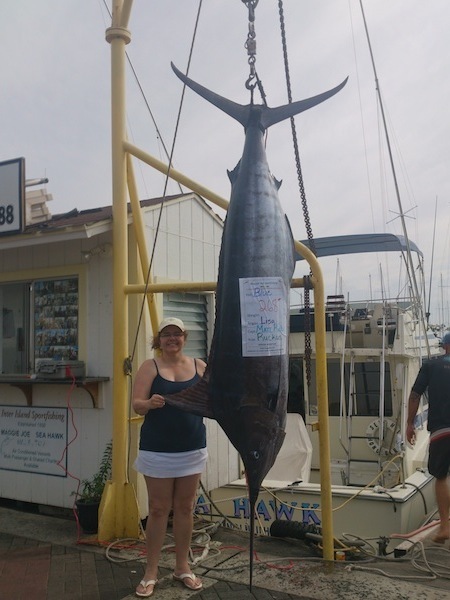 Lisa with 268 lb Blue Marlin! Mahalo to Lisa for choosing Maggie Joe Sport Fishing! She joined Captain Matt aboard the Ruckus on a sport fishing charter. She did a great job hauling in this nice 268 lb Blue Marlin while deep sea fishing off Honolulu, Oahu. Aloha!